Size: 8ft 6in x 3ft 6in (260 x 107cm). 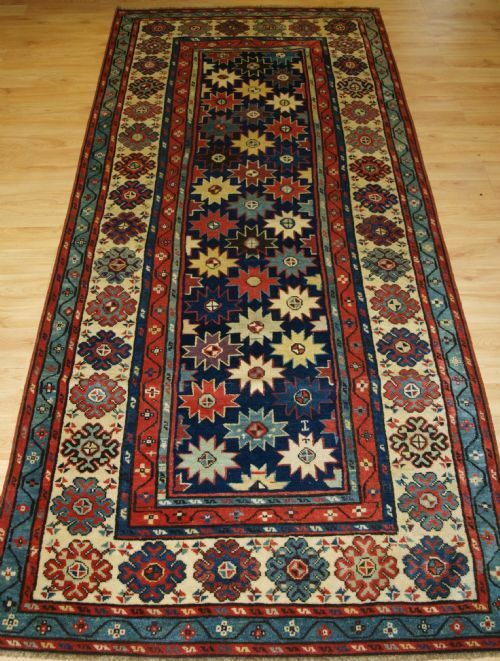 Antique Caucasian Talish long rug with all over star design. A superb example of a Talish long rug, multi coloured stars on a midnight indigo blue field framed by a classic Talish border on an ivory ground. Size: 9ft 9in x 3ft 7in (298 x 108cm). 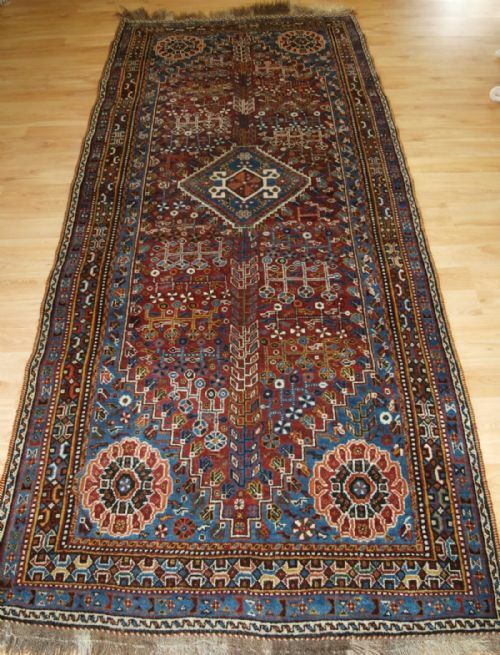 Antique Caucasian Talish long rug with Memlinc gul design and outstanding colours. A superb example of a Talish long rug, multi coloured Memlinc guls in compartmented boxes framed by a classic Talish border on an ivory ground. The mustard yellow is really superb. The rug is of a fine weave with very good wool. Size: 10ft 8in x 3ft 7in (325 x 110cm). A truly superb runner with very genuine age, original end finishes. Size: 10ft 1in x 3ft 7in (305 x 108cm). Size: 10ft 0in x 3ft 2in (300 x 97cm). 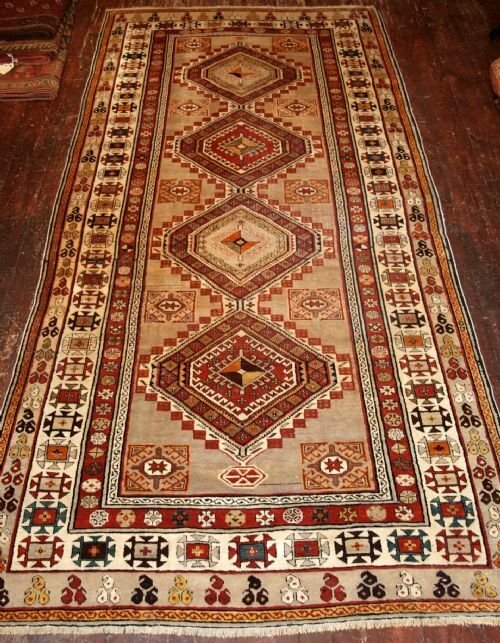 Antique Caucasian Seichur or Alpan-Kuba runner. A superb runner of classic design. Beautifully drawn, very subtle border. True showroom condition, even wear with low pile. Size: 9ft 11in x 3ft 6in (302 x 108cm). 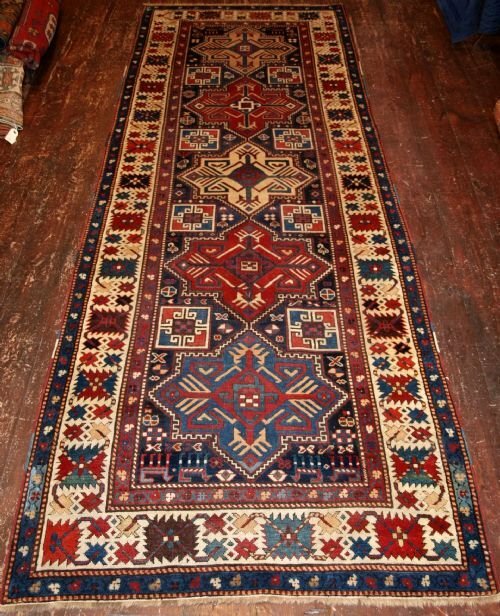 Antique Caucasian Shirvan runner from the South Eastern Caucasus. with Lesghi star design. 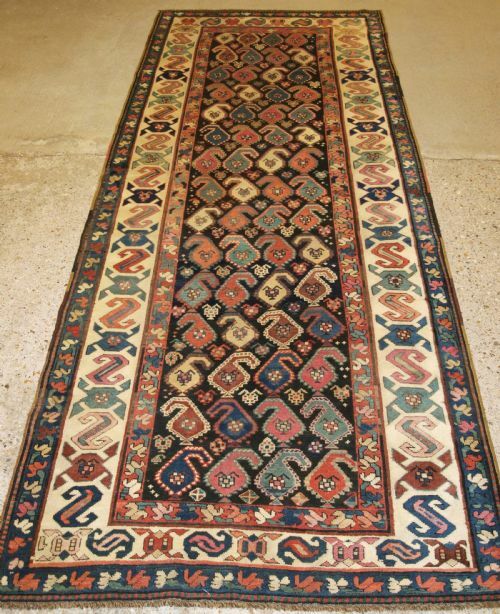 A very good example of a Shirvan runner, fine weave and outstanding colours. The field is a repeat medallion of the Lesghi star design surrounded by classic ivory ground Caucasian border. Size: 14ft 5in x 3ft 7in (440 x 108cm). 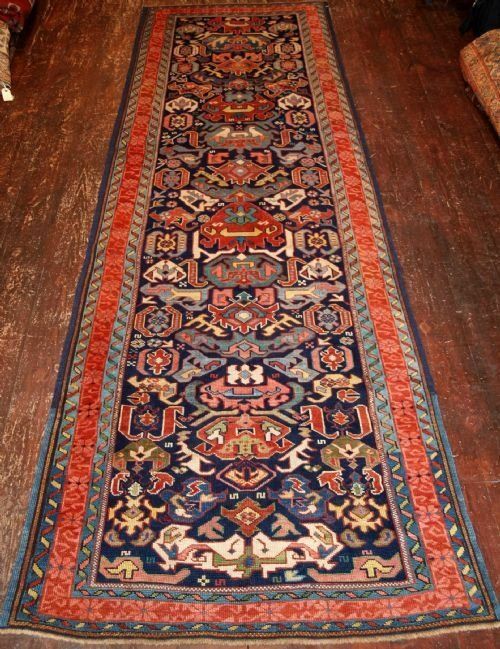 Antique Persian Bijar runner of good size with traditional mina khani design. 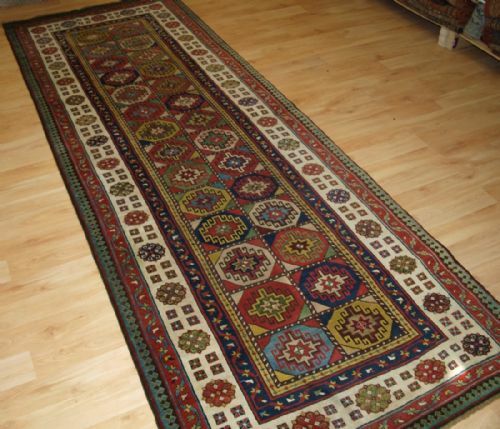 The runner has excellent colour and design, especially the mina khani (many flowers) design which is beautifully drawn. The ivory ground border with a flower and leaf design frames the runner well. The runner is in excellent condition with even wear and medium pile. The runner has been hand washed and ready for use or display. Size: 18ft 6in x 3ft 7in (563 x 110cm). 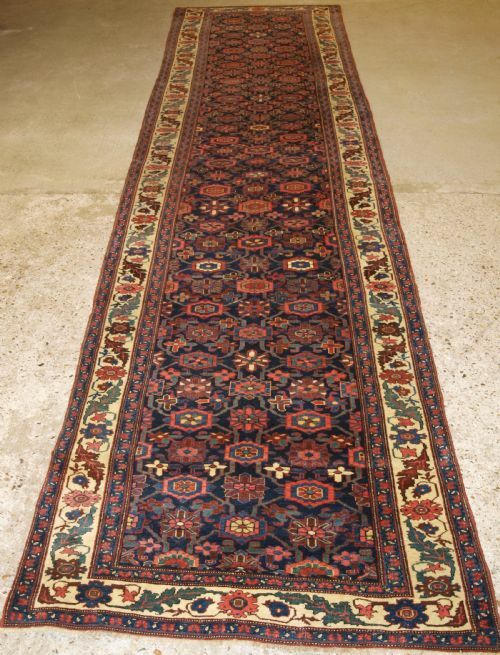 Antique Persian Bijar runner of long size with traditional repeat medallion design. The runner has excellent colour and design, with madder red and abrashed indigo blue to the field. The field is covered with the herati design. The ivory ground border with a flower and leaf design frames the runner well. This superb runner would grace any country house. The runner is in excellent condition with even wear and medium pile. The runner has wool pile on a wool foundation. Size: 9ft 6in x 3ft 8in (290 x 111cm). 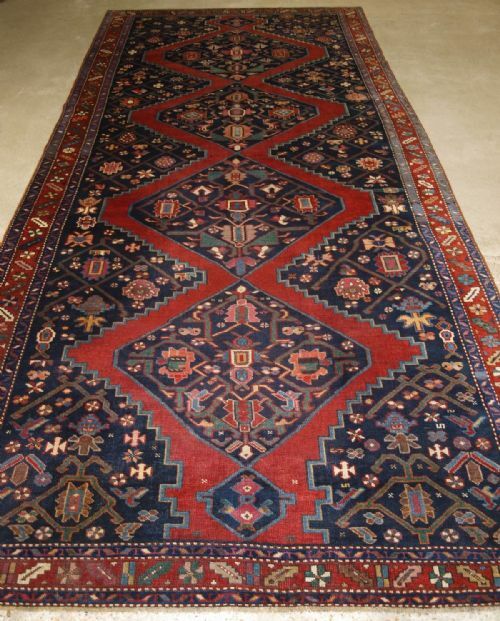 Antique Caucasian Karabagh region runner with all over colourful large boteh design. 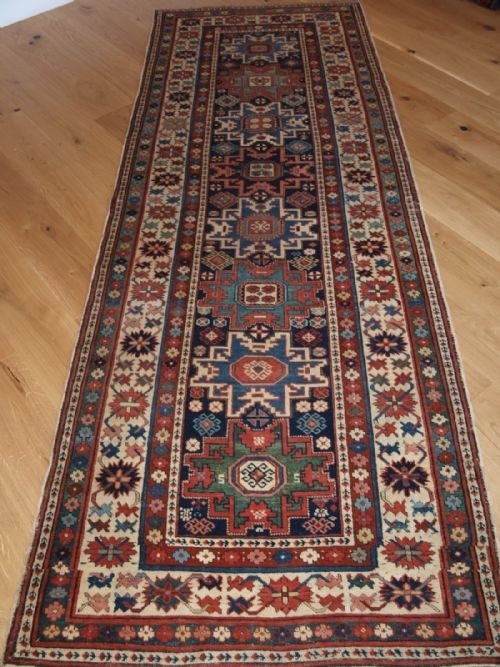 A good example of a Karabagh runner, the large size boteh are filled with pastel colours and shine on the midnight indigo blue ground. The border is exceptional with a large scale design on a ivory ground. Size: 10ft 1in x 4ft 9in (307 x 144cm). Size: 13ft 4in x 5ft 8in (407 x 174cm). Antique South Caucasian Karabagh kelleh or long rug of large size. The rug has a lattice design on a dark indigo blue ground, there are good reds and greens throughout the rug, the border is very pleasing and on a madder red ground. The rug is in excellent condition with even wear and low pile. Size: 9ft 6in x 3ft 11in (290 x 119cm). 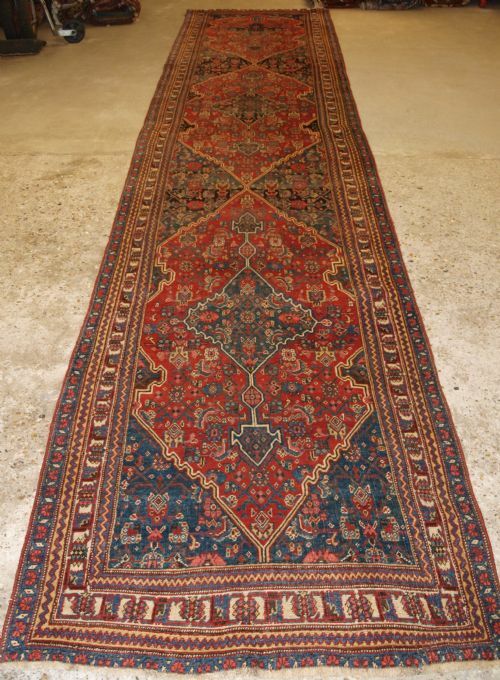 A good Antique Persian Qashqai runner / long rug, with a classic Qashqai design. The runner has excellent wool and superb colour. The design is one of the most traditional of all Qashqai designs, with the Qashqai tribal medallion in the center. The rug is in excellent condition with very slight even wear and full pile. The rug retains the original end finishes at both ends.